Was forwarded this by Kurt Boone. 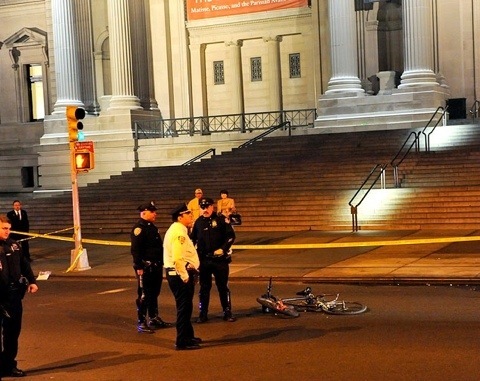 Bicyclist, 27, killed joyriding in front of Met Museum. Daniel Martinez was riding south on Fifth Avenue near E. 83rd Street around 6:30 p.m. (4/18/12) when he grabbed onto the rear of a Ford F55, cops said. My condolences to Daniel’s family on this tragic event. Details on this case based solely on the newspapers description don’t seem to add up. Not exactly sure how someone dies from holding on to a truck that makes a stop at a red light. I also have a problem with the word joyriding. 6:30pm, the time of death, sounds like working hours for a bike courier and not just out for a thrill that the papers description implies. This is not to condone “skitching” however, most riders who engage in this dangerous activity, generally have heightened skills in the operation of their bicycle and are more aware of the dynamics of the vehicles and drivers involved based on years on the streets. My point is not to avoid blame but rather to question the details especially in light of the recent lack of police investigation when it comes to cyclists deaths. All to often the case is written off as a tragic accident and blame is immediately placed on the cyclist, especially when words like joyriding are used in the papers. How do we know the driver wasn’t texting on his phone, looked up and saw a red light. Then he slammed on his brakes and the rider died. Then the driver tells police he was skitching. So true! I was injured by a MTA bus while working as a bike messenger in NYC back in 1990 and when I got the accident report from my lawyers I was astonished at what the cop had written. While waiting for the ambulance to arrive he had only asked me 2 or 3 yes-or-no questions and I never had a chance to tell my side of the story.